Welcome to North Reading, Ma! North Reading is a quintessential small New England town. Its beautiful town center showcases historic town buildings and the town common, which becomes the town sledding hill in the winter months. Also, set high on the hill for all to see is the new state of the art, top ranked North Reading High School/Middle School complex. This picturesque suburban town is located 17 miles north of Boston where residents can easily access all the major highways (Rt 93, I95, Rt 1) when commuting to the city and only minutes away from the commuter rail system in Reading, Wilmington and Andover. 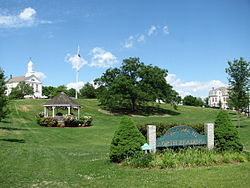 North Reading is home to Ipswich River Park , a gathering place for North Reading residents all year round and the location of many town events such as firework displays, food truck festivals and the seasonal farmers market. This 49 acre site features a conservation area and restored wetlands, a paved two-mile walking path, parking areas, a canoe launch, wild flower meadows, gazebo and flagpole, tennis and basketball courts, playgrounds and picnic areas, softball, baseball, soccer and all-purpose fields, a street hockey rink, and horseshoe pits. Other amenities that North Reading offers is two golf courses Hillview Public Golf Course and Thompson Country Club, a private pool/tennis facility-Resorts North and Martin’s Pond; home of the town fishing derby. There is also a strong vibrant park and recreation department plan many town wide events and have many programs for all ages. To socialize and mingle with many of the North Reading residents visit the local dining establishments, such as, Theres’s Prime Steakhouse, Grille 19, The Horseshoe Grill, Joe Fish, Los Dobos, and Kitty’s. Don’t miss the local sub/pizza shops; The Hornets Nest, Mike’s Famous roast beef, Andrea’s pizza and Beyond Bagels. When you visit North Reading please come by our office located at 133 Main Street to say hi and let us give you personal tour of our great town! The long-awaited, 55+ community - MARTINS LANDING! IN A MODERN SECURE ELEVATOR BUILDING! Move-in Ready! This 1,470 SF single level located in the sun-filled corner of the building includes a 2-car tandem secured covered parking space. The Islebrook style home features an open eat-in granite kitchen with white cabinets, large living room w/private balcony, Flex/ dining area, spacious master suite w/walk-in closet, full bath with stall shower, full sized side by side washer & dryer, hardwood flooring plus lots of crown & panel moldings. A second wing features a Guest Suite with full bath. Quaint, quiet community close to all major highways shopping, recreation & More! Please Visit our Sales Office Open Tuesday - Sunday 10-4, Monday's by Appointment. Prepare to fall in love with this exceptional home! Beautifully updated throughout and ready for you to move in. Fabulous newer granite/stainless kitchen that opens to the sunny dining area with gorgeous detailed moldings and built in china cabinet. The front to back living room with fireplace has sliders to your screened in porch that adds great entertaining, dining, or just relaxing space for almost 3 seasons. This home boasts 2 generous sized bedrooms and a Master bedroom with an amazing walk in cedar closet. The Partially finished basement is a great space that could be an office, playroom or craft area. The Large level private backyard with brick patio is the perfect place for summer bar-b-cues. Mudroom, hardwood floors, updated baths, 1 car garage, patio and a great commuter location are just a few of the reasons this is a home you don't want to miss! Renovated and expanded, 3 Bed and 2 Bathroom, 2-Level Contemporary House in North Reading. Located on a wooded, dead-end street, this makes a wonderful mid-sized home, offering lots of natural light and modern open-concept floor plan. Remodeled throughout, you will love the beautiful kitchen with quartz counters, stainless appliances, shaker cabinets and skylight windows. Spacious and open main floor offers dining and living room areas, separate sun room office, two bedrooms, and tiled full bathroom. Newly built second level offers added comfort, with a large master suite and en-suite bathroom and study area. More features include new roof, new central heat, new central AC, new washer/dryer, detached storage shed, large yard, and driveway parking. Easy access to 93 and 128. Take advantage of North Reading's excellent schools and the close proximity to Main Street's shopping and restaurants. Welcome Home! Listed by Charles Elia and John E. Magazzu of RE/MAX Renaissance Inc.
Just add your finishing touches to this Handicap accessible 4 bedroom Raised Ranch in North Reading. Home features updated EIK kitchen with granite counter-tops and stainless steel appliances, central air conditioning, a Master bedroom off kitchen with a 3/4 bath, sliders leading to a three season screened porch, Hardwood floors throughout the bedrooms with one zone oil baseboard heating. Washer Dryer hookup in one of the bedroom plus another hookup in the basement as well. Basement has concrete floor with work shop area and can be finished if needed. Exterior has wood shingles which can be painted to your chosen color plus 4 off-street parking spots and a 1/4 acre lot. Roof is only 5 years old. Title V is in the process of getting done.